Click on the map to view the trails! Check our Facebook page for the latest Trail Conditions! Over 15 km of groomed classic and skate ski trails ~ there's a trail for every age and skill level. All trails are signed with shortcuts back to the Chalet if you get tired. Be sure to take advantage of the 5 km of lit trails on the Jackrabbit and Challenge loops. Trail lights are on every night from 5pm to 9 pm (unless its -20 degrees celcius or colder, then we are closed & lights are turned off to save energy). Just learning, want some scenic time out, or skiing with kids? The 7.4 km Jackrabbit Trail is an easy network of long downhills, gradual uphills, and flat stretches. Be sure to take a break on the Riverview Loop to listen to the river below. Looking for bigger hills? The 3.3 km Challenge Trail is an intermediate trail, with a mix of steep and gradual hills. Take a moment to enjoy the waterfall on the Cascade Loop. Like roller coasters? The 4.6 km Olympic Trail is a twisting and turning adventure that will make your adrenaline rush. Don't run before you can walk! Snowshoeing is the new craze! 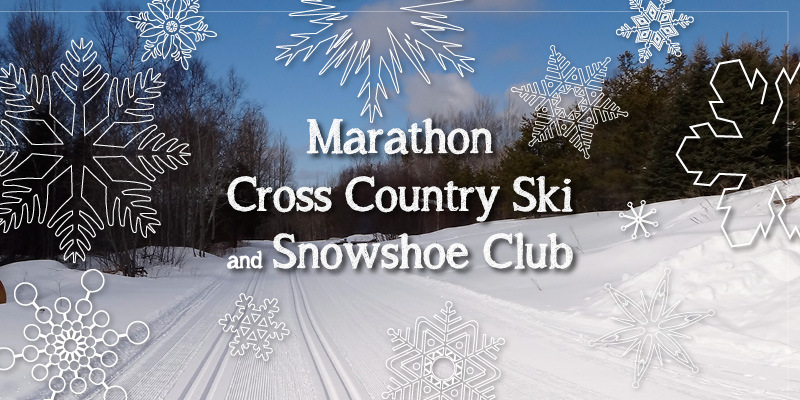 Enjoy 5km of beautiful trails through the forests with awesome views across Marathon! You can rent a pair from the Chalet or bring your own. All snowshoe trails are signed. Due to the hilly terrain all trails are considered moderate to difficult, with the exception of the green lit trail, which is considered easy to moderate. Snowshoers are welcome to walk on the lit part of the ski trails on the right hand side and should be mindful that skiers may approach without warning at speed. Please stay respectful of other users at all times. Dogs are permitted on the snowshoe trails but not on the lit ski trail.